Goldman's latest research suggests that the Fed is likely to ease at the next meeting this month. This assesment is primarily based on their proprietary indicator called the GS Financials Conditions Index (GSFCI). As a backdrop, they point out that the US economy has slowed, as shown in the chart below. 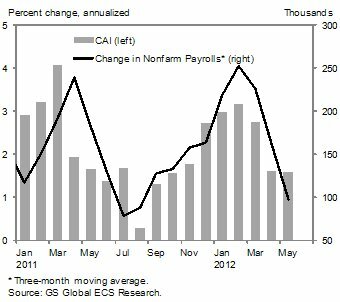 Both the nonfarm payroll growth and the CAI index (Goldman's index of broad economic activity) have declined sharply. 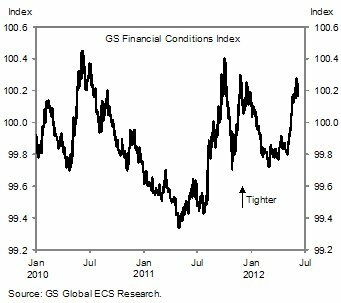 At the same time the Financial Conditions Index has shown a substantial tightening. GS: - "In light of the weakening data and the intensification of the Euro area crisis in recent weeks, Fed officials have started to raise the possibility of additional monetary easing. Fed Vice Chair Janet Yellen and New York Fed President William Dudley, for example, identified three conditions that would warrant additional easing. These include: (1) an unsatisfactory pace of economic recovery, such that little or no improvement in labor market conditions is made; (2) sufficiently large downside risks to the outlook; or (3) a notable decline in core inflation below the FOMC’s 2% objective." 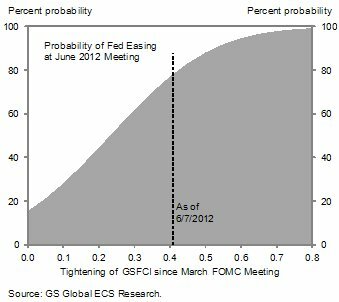 ﻿﻿The chart below shows the Fed's easing probability as a function of GSFCI, which puts the probability for the next FOMC meeting at around 75%. The Fed has limited options, one of which is quantitative easing (QE). But an outright QE3 is still unlikely however. Many point to the fact that this being an election year makes QE3 more probable as the current administration would be looking for Fed's support in a slowing economy. But an argument could be made that given how unpopular QE had been in the past with the public, the Fed is not likely to "rock the boat" - particularly in an election year. As much as we want to believe in Fed's independence, many of the FOMC members are keenly aware of the political implications of an unpopular policy decision - in particular a decision that may have only a limited impact on growth. Instead we are likely to see an extension of Operation Twist, which may ultimately morph into sterilized securities purchases.